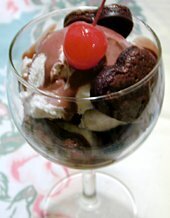 A thin brownie cut into heart shapes makes for one sweet sundae. 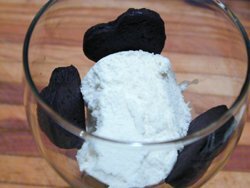 Use the extra brownie (including scraps) for snacks, stacked sundaes, or ice cream sandwiches. Wrap tightly and freeze for up to a month. 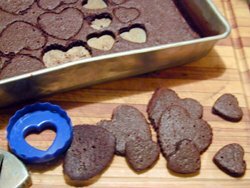 You’ll need a small heart-shaped cookie cutter. You could always uses brownie mix and chocolate syrup, but you’ll only save about 10 minutes all told, and the flavor is far less impressive. Preheat oven to 350 degrees. Butter an 11 x 13 cake pan and dust with cocoa. Tap out excess cocoa and set aside. In a medium bowl, beat together the butter and sugar. Add eggs, and mix well. Beat in flour, cocoa and salt; add vanilla. Spread evenly into the prepared pan. They’ll be much thinner than normal brownies, because you’re using a much larger pan. Bake for 15 minutes. Cool slightly, then cut out 5 – 6 small hearts per sundae. Save extras (including scraps) for snacks, stacked sundaes, or ice cream sandwiches. Wrap unused brownies tightly and freeze for up to a month. While brownies bake, make chocolate sauce. (Sauce may also be made several hours ahead.) Combine sugar and cocoa in a sauce pan over low heat. Add the cream in a slow stream, stirring. Allow to cook for about 8 minutes, or until it has slightly thickened, while stirring constantly. Allow to cool slightly. Store in a sealed container at room temperature until ready to serve. To assemble, place a small scoop of ice cream in a wine glass. Surround with small brownie hearts and top with a bit of sauce. Repeat to fill glass and top with a cherry. This entry was posted on Thursday, September 13th, 2007 at 7:44 am	and is filed under Desserts, Master Recipe Index, Speed Queen (30 min/less), Vegetarian. You can follow any responses to this entry through the RSS 2.0 feed. You can leave a response, or trackback from your own site.